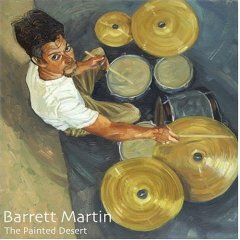 �The Painted Desert� This is his first solo work, an album of 12 compositions all recorded in, or inspired by deserts around the world. Initially started in 1998 at �Rancho De La Luna�, a studio in the Joshua Tree National Monument, Barrett completed the work recently at his own �Fast Horse Solar Studio� in Taos, New Mexico. The album, inspired by the weather patterns and fragile beauty of life in the desert, is also an amalgamation of the musical influences Barrett acquired while traveling abroad. Featuring the previously mentioned Luis Guerra on upright bass, Tuatara horn players Skerik and Craig Flory on saxophone and flute, as well as New York jazz musician Dave Weeks on trumpet, the album grooves hard with Afro-Brazilian inspired rhythms and haunting melodies that exude the beauty of nature. Further layers of Indonesian gamelans, African drums, and exotic percussion give the album an otherworldly quality that can only be experienced from having spent time in African, South American and Australian deserts, as Barrett has experienced. Barrett Martin plays Tama Drums, Sabian Cymbals and ProMark Drumsticks.